Choosing a Scandinavian dish for The Food Connection - a beautiful project initiated by Savori Urbane - hosted this month by Teodora @ Teo’s Kitchen wasn’t easy and not only because I am not an expert of Nordic cuisine but because when I started digging a bit I realized that there are a lot of things that I would try. However, considering that salmon is almost always on my to buy list I decided to prepare a dish I prepare often – Gravlaks. The funny thing is that I ate Gravlaks from the first time here in Italy during a dinner prepared by my friend and not in a Scandinavian Country. 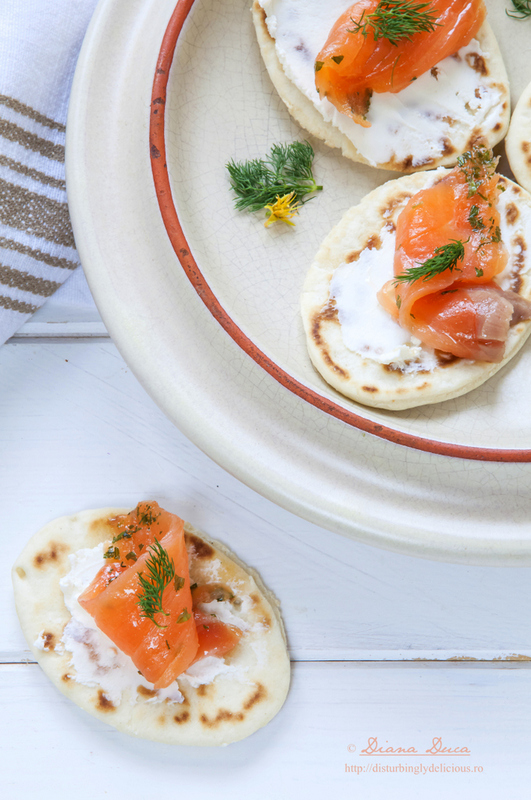 Gravlaks is the name of a cured salmon in a mix of sugar, salt, dill and sometimes cognac, akvavit or vodka. As it happens often with the traditional dishes, you will find various recipes and normally the differences are related to the salt/sugar proportion used for the marinade. Some people prefer it sweeter while other prefer a saltier version of gravlaks. I think I pertain to the second group that it why I prepare the marinade using salt/ sugar in proportion of 2:1. It is just a matter of taste . Remove any bones from the salmon with tweezers. Combine salt, sugar, pepper and dill in a bowl and stir together. Sprinkle half of the salt mixture on each fillet rubbing it with your fingers. Drizzle 1 1/2 tbs of cognac over each piece of salmon rubbing it with your fingers. Place a piece of salmon skin side down in a glass baking dish. Lay the other piece on top (skin side up). Cover loosley with a sheet of plastic wrap then place a smaller baking dish on top. Weigh it down with something heavy. Refrigerate for two or three days turning the fillets over (the top fillet would be on the bottom) and basting it with the liquid accumulated in the baking dish. After three days of curing the salmon can be served. 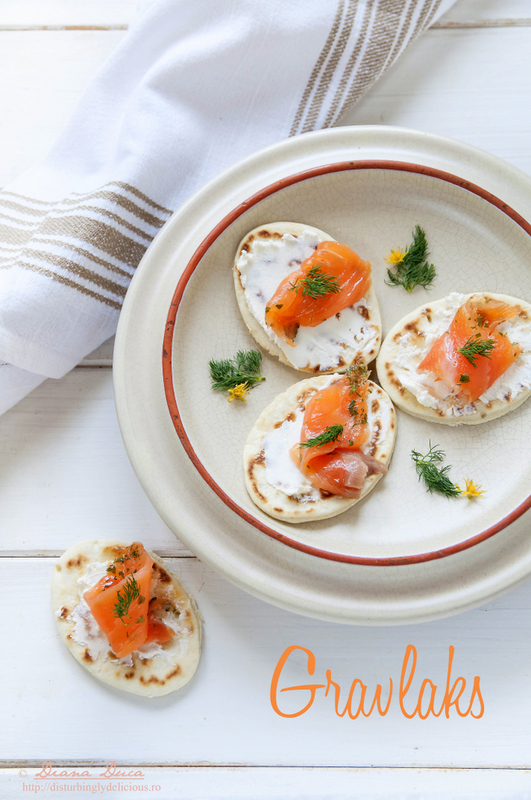 Cut thin slices and serve with blinis, toast or crackers. It is usually served with a mustard sauce but I preferred it this time with cream cheese. You can also serve it with crème fraîche. Desi nu este o bucatarie elaborata, sofisticata sau foarte variata, bucataria nordica are ceva-ul acela care o face sa fie atractiva, cel putin pentru mine: simplitate in alegerea ingredientelor, citeva reguli de baza intr-ale gatitului si folosirea doar a produselor pe care le ofera arealul in care-si manifesta prezenta. Si, cu toate astea, sunt citeva preparate care mi-au ramas la inima de la prima degustare. Iar gravlaxul se numara printre ele. Reteta este destul de usor de urmarit, dar cred ca te ajuta sa iti impresionezxi oaspetii,. Tu de unde cumperi somonul?